Celebrate the joyful spiritual spark found in Africana worship! Worship is the lifeblood of the church. 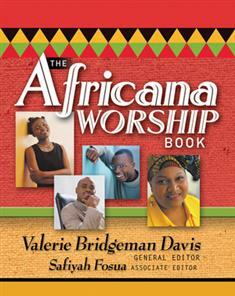 To Africana worshippers, God is very present in the service, and the response is heartfelt, jubilant and authentic. The Africana Worship Book uncovers the "best-of" from the African-American church as well as from the Caribbean, American, and African shores. The collected works found in this resource, which are based on Year A the Revised Common Lectionary, include profound and grace-filled liturgies for prayers, calls to worship and giving, choral readings and creedal statements—all written by 16 African-American contributors to represent the rich worship cultural heritage of this community. Worship resources for special days like Black History Month, Martin Luther King Jr. Day, and Watchnight are also included. "This book satisfies my longing for relevant, prophetic, and 'keeping it real' God-talk," writes one reviewer. "I was stunned by the power and forthright liturgical honesty of this book. As people of the Word, the Spirit, and ancestral legacies spoken and implicit, we sometimes find ourselves bereft and numb when the incongruity and surprise of our 21st century lives collide with what we know about who we are in the sight of God. These resources remind me that as a people of faith, we are still on the journey toward a hopeful future." Discover new heights and depths of praise in the pages of this forward-looking, cultural celebration. CD-ROM included! Easily copy and paste excerpts from the many creative prayers and meditations of The Africana Worship Book for use in your own congregation's printed orders of worship.